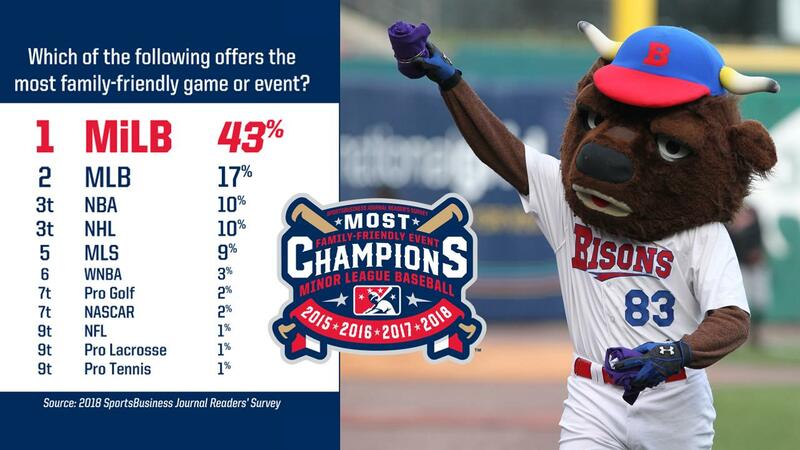 Fourth straight year that MiLB named "Most Family Friendly"
The Buffalo Bisons experience and Minor League Baseball as a whole continues to be a fan-favorite among sports fans and families in North America. Minor League Baseball was voted the "Most Family-Friendly Game or Event" according to a Sports Business Journal/Daily's Reader Survey. This is the fourth consecutive year that Minor League Baseball was voted to the top of this category. The Bisons have always prided themselves on providing the absolute best sport family and entertainment experience and value at every event. Promotional nights like the KeyBank Independence Eve Celebration, Star Wars Night and Superhero night have become WNY must-attend events and the Honda fridaynightbash! Series has been a weekend summer tradition for more than 30 years. A full 2019 promotional schedule for the upcoming season will be announced in January but fans can plan on even more great family events to come! A major part of being 'family-friendly' is providing tremendous value, something the Bisons are already continuing in 2019. The team recently put all their 2019 Ticket Packs on sale which can help fans save big when they bring the family out to the ballpark, especially for those bigger nights like the KeyBank Independence Eve and Star Wars Night. The popular 12-game Flex Pack also includes over 30% in savings and allows families to pick the games they want to attend and in what combination. The best deal at the park is for the kids, as well. The Buster's Kids Club includes two tickets, a membership t-shirt, free concession items and exclusive parties… all for only $15 (CLICK HERE). Right now, the savings have gotten even bigger with the limited time Holiday Packs. These combo packs include Opening Day Tickets, Flex Tickets, a Vladimir Guerrero Jersey ornament as well as a special merchandise item with savings up to 66%. CLICK HERE to view the options available. Great deals on great nights. Minor League baseball is major fun and the Bisons look forward to remaining a top destination for families again starting with Opening Day, April 4, 2019 at Sahlen Field.